NEW JERSEY is the Garden State, but that nickname wasn't always so secure. Unofficially, it dates to at least 1876, when Abraham Browning of Camden likened "our Garden State" to "an immense barrel, filled with good things to eat and open at both ends, with Pennsylvanians grabbing from one end and New Yorkers from the other." But in 1954, when the State Legislature voted to add the moniker to license plates, Governor Robert B. Meyner vetoed the measure, saying, "I do not believe that the average citizen of New Jersey regards his state as more peculiarly identifiable with gardening for farming than any of its other industries or occupations." He was overruled. Nowadays New Jersey ranks second among states in blueberry production, third in cranberries and spinach and fourth in bell peppers, peaches and head lettuce, the official state Web site boasts. Its status in flowers is unrecorded. But never mind the state's reputation for being rather unlovely in places, gardens are what I set out to find. I visited five public gardens in five counties. Three are, as Michelin would say, "worth a detour." Often I was alone with just the birds and other animals, which didn't seem to mind the company. Once, when I stopped to take a picture, a chipmunk ran between my feet. The New Jersey Botanical Garden, in Ringwood, in the northern part of the state, was the most pleasant surprise: an enchanting collection of specimens. It helps to stop at the visitors' center, which offers a map and brochures about each specialty garden. When I was there, in mid-May, the annual beds were bare, though the peonies in the neighboring perennial garden were about to bloom. Across the road, however, the site began to shine. Behind Skylands Manor, a 1920s Tudor revival mansion on the property that's used as an inn, lies a series of tiered gardens: they start with hip-level beds of irises, violets and similar flowers that form an octagon around a stone fountain and gradually descend to a magnolia walk, azalea chamber, summer garden and tree peony garden. On the left, clusters of lilac trees — past their prime, but many still blooming — created an aroma that, like one of Proust's madeleines, sparked a remembrance of springs past. You can cross the road again to find gardens with a less manicured feel. On the trail along the pond you may hear a chorus of frogs while you take in the yellow water lilies. And don't miss the moraine garden, which simulates a glacial area with mint-family plants, lily of the valley, ferns and the like, or the rhododendron and hosta gardens. Equally worth a trip is the 127-acre Frelinghuysen Arboretum, in Morris Township, which describes itself as "part English-style park, part flower gardens, part working farm" built around a Colonial Revival home. Near the visitors' center, small patches illustrate "color gardens." The blue garden wore full regalia on my visit, a mélange of blue and purple pansies, purply-blue aubrieta gracilis, true blue ladybells, brunnera and sweet Kate spiderwort. There's also a yellow-red garden, but its time had not yet come. Behind the mansion is a rose garden, with climbing roses and tea roses strutting their stuff, some a bright cerise. When you've finished smelling the roses, head for the gazebo, which offers a beautiful vista of a grassy area framed by baronial trees. And nearby is a charming knot garden, fashioned from trimmed boxwood hedges of differing shades of green in a four-point design. The Frelinghuysen has two distinctive features: a garden for people with "special needs," which was wheelchair-friendly but disappointingly small and spare, and a Braille nature trail, whose signs for the blind point out tree varieties, for example. Unfortunately, the promised guiding rope, with balls signaling where to stop for the signs, was missing. 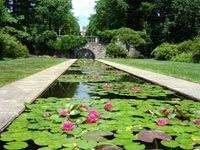 A little farther south, in Bernardsville, is the Cross Estate Gardens, within Morristown National Historical Park. Drive right up to the mansion, a Queen Anne-style summer retreat dating to 1905 (now closed), and park in the circular driveway. The very appealing gardens, laid out in the 1930s, are entered through a nearby wooden gate. A pergola — abloom with pendulous wisteria clusters in the spring — has weather-worn wooden benches that make a perfect spot for gazing at the flowers. Bees and birds provide background music. On the right lies a formal walled garden, with brick walks and flower boxes. The regularly replenished beds held, on my visit, a variety of tall, purple-veined gas plants; irises in blue, purple and yellow; white peonies; yellow foxglove; and hosta. On the left is a native plant garden, its paths lined with pebbles. After the walled garden, this one seems unruly, a mille-fleur tapestry of ferns, oakleaf hydrangea, red-vein enkianthus, jack-in-the-pulpit, Virginia sweetspire, cardinal flowers, rusty red Canada columbine and various anemones. Nature rules here: I wasn't surprised to learn that a New Jersey Audubon sanctuary was nearby. I drove south, to the Pine Barrens, stopping in Lakewood at Georgian Court University. The campus, once the winter estate of the robber baron Jay Gould's son George Jay Gould, is home to the Sister Mary Grace Burns Arboretum. The wonderful aroma of fresh-cut grass was in the air. Little wonder: the largest garden here — the so-called Italian garden — is more grass, statuary and flowering trees than flowers. Amid its formal design, with crisscrossing paths, pergolas and Greek-god statuary, are groves of Colorado blue spruce, Norway spruce, yellow poplar and Southern magnolia. Likewise, the "sunken garden and lagoon" features marble urns, a staircase flanked by lions, a bridge, a fountain and a wonderful view of Lake Carasaljo, but no plants or flowers to speak of. The formal garden, a maze of boxwood hedges, has seen better days and had none of the advertised annuals or perennials on my visit. But there is a gem here: a one-acre Japanese garden designed by Takeo Shiota, who plotted Brooklyn Botanic Garden's Japanese Hill-and-Pond Garden, which, when it opened in 1915, was the first public Japanese garden in America. Shiota was known for traveling all over Japan — on foot — to learn the natural landscape. Here, he created an oasis anchored by a bushy Japanese yew, which shelters benches, and a tall, red-barked Japanese umbrella pine. Around them you'll find a grove of traditional, rust-leaved Japanese maple, along with samples of paper-barked maple, weeping Higan cherry, Japanese cherry and others. Beneath them are beds of blue and white irises and other flowers, and nearby are tall purple rhododendron bushes. The garden paths rise and fall to create a gnarled landscape that passes a restored brown-and-cream-color tea house (which, alas, sits empty). Be sure to ask the campus entry guard not only where to park, but also how to find the library, where visitors may obtain a handsome garden guide. In nearby Princeton, you can enjoy fantasies of paying a call on the governor as you drive past a columned mansion on the way to the parking lot of the Morven Museum & Garden, which was the New Jersey governor's mansion from 1945-81. This 18th-century home of Richard Stockton, a signer of the Declaration of Independence, was converted to a museum in 2004, and its lower floors are now galleries for furniture and decorative arts. The five-acre property, fronted by a stately lawn, counts as the garden. On one side a horse chestnut walk blooms in spring with delicate pink-and-white flowers. Out back, a square lawn is bordered by blue milkweed, irises and blue bells, along with deep red peonies. Morven was the smallest, and least interesting, of the five New Jersey gardens on my route — but it is in Princeton, which has other charms to compensate. NEW JERSEY BOTANICAL GARDEN 2 Morris Road, Ringwood; (973) 962-9534, njbg.org. Open daily 8 a.m. to 8 p.m. Free. FRELINGHUYSEN ARBORETUM 53 East Hanover Avenue, Morris Township; (973) 326-7600; arboretumfriends.org. Open from 9 a.m. to dusk daily. Free. 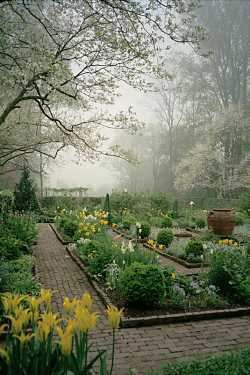 CROSS ESTATE GARDENS Old Jockey Hollow Road, Bernardsville, in Morristown National Historic Park; (973) 539-2016, Ext. 210 (National Park Service); crossestategardens.org. Open from dawn to dusk. Free. SISTER MARY GRACE BURNS ARBORETUM Georgian Court University, 900 Lakewood Avenue, Lakewood; (732) 987-2373, georgian.edu/arboretum. Open 8 a.m. to dusk daily. Free. MORVEN MUSEUM & GARDEN 55 Stockton Street, Princeton; (609) 924-8144, historicmorven.org. Open Wednesday to Friday, 11 a.m. to 3 p.m.; Saturday and Sunday, noon to 4 p.m. Closed on holidays. Gardens are free. For the museum: $5; $4 for students and those 60 or older; free for children under 8.